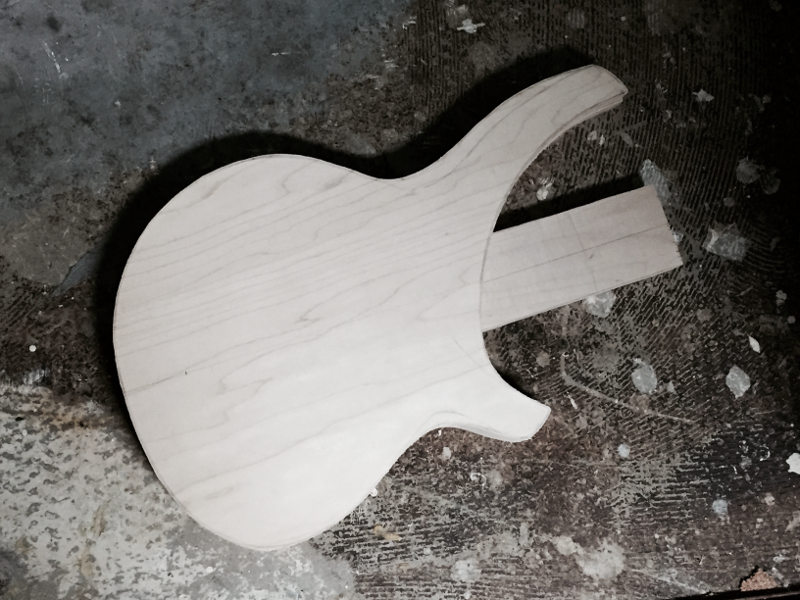 We’re working on a solid body, short-scale, electric bass. Here’s where we are so far. The solid body is plywood. Since she’s a prototype, we’re going with simple utilitarian wood. Not too heavy, not too light, but very stable and strong. It’s something we can really cut and shape. The body will eventually be painted with milk paint so it will have a coarse, distressed look. It’s a prototype after all, a test mule so we want to be able to keep cutting and shaping as needed. For the electronics, we’re going with a passive EMG Geezer-signature, P-bass pickup. About as simple as we can go. It’s a passive pup and requires no battery. One volume control and one tone control… that’s it. We’ll use this bass to optimize the position of the pickup and work out the ergonomics. The neck will be quartersawn ash, like a fine baseball bat. Its profile will be fast and shallow similar to an Ibanez with a hint of our asymmetric “comfort” shape. We’ll use a low-profile truss rod so we can make the neck nice and thin. Tuners will be Hipshot Ultralights and the bridge will be an adjustable Schaller. It’s an interesting and intriguing project.